Here is one man’s opinion of the biggest wins in Mets history, ranked in order. The Mets are looking to make some more history beginning tonight when they face the Royals in the World Series. 1. The Amazins: Perhaps the most improbable champions ever, the Miracle Mets overcome a 3-0 deficit and defeat the Orioles 5-3 to take the 1969 World Series in five games. Series MVP Donn Clendenon and Al Weis homer and Jerry Koosman hurls a complete game as the Mets go from the outhouse to the penthouse. 2. Gets past Buckner: The heavily favored Mets, 108-game winners, are a strike away from elimination in the 10th inning of Game 6 of the 1986 World Series. Then base hits by Gary Carter, Kevin Mitchell and Ray Knight, a wild pitch that plates the tying run, and a Mookie Wilson grounder that eludes Red Sox first baseman Bill Buckner lead the Mets to a 6-5 win over the stunned Red Sox. 3. Seventh heaven: Two nights later, after a rainout, the Mets win their second World Series with an 8-5 win over the Red Sox in Game 7. Series MVP Ray Knight and Darryl Strawberry hit home runs to rally the Mets, who trailed 3-0 in the sixth inning. 4. You gotta believe: In 1973, the Mets languished in last place as late as August 30, then won 21 of their last 29 games and beat the Cubs 6-4 to take the NL East. Buo yed by reliever Tug McGraw, who coined the rallying cry “You gotta believe,” and manager Yogi Berra, who said “It ain’t over ‘till it’s over,” the Mets beat the Reds for the NL pennant, but lost a seven-game World Series to the A’s. 5. 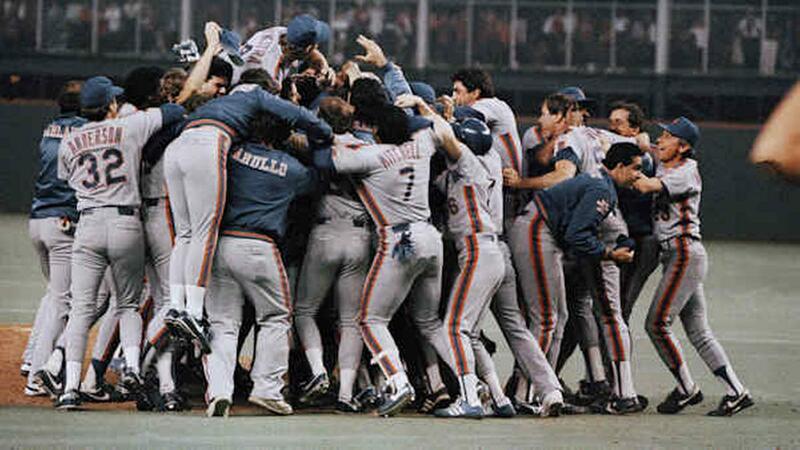 16 innings: The Mets were down 3-0 entering the ninth inning (detect a theme here) before coming back and eventually prevailing 7-6 over the Astros in 16 innings in a dramatic showdown at the Astrodome to win the 1986 NLCS in six games. Celebration above. 6. Daniel Boom: Daniel Murphy turns into Babe Ruth right in front of our very eyes, homering in a playoff game for a record sixth consecutive game. Murphy’s blast earns the Mets an 8-3 win and a four-game sweep over the Cubs and this year’s NL pennant. Murphy takes NLCS MVP honors. 7. Wild night: This 1985 classic started as a July 4 game and finally ended at nearly 4 am the next morning. The Mets beat the hometown Braves 16-13 in 19 innings, after Atlanta pitcher Rick Camp tied it with an unlikely 18th-inning home run. 8. Yes, Yes: The date was June 1, 2012. After more than half a century and 8,020 games, left-hander Johan Santana pitches the first no-hitter in franchise history in a victory over the Cardinals at Citi Field. The Mets defeated the Cardinals 8-0. 9. 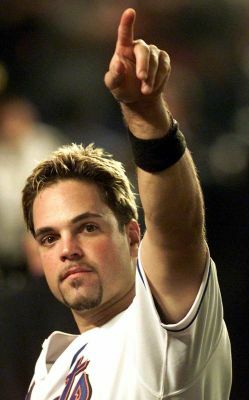 9/11/2001: As New York and all America grieves over the the 9/11 attacks, Mike Piazza, left, gives us something to smile about. Piazza belts a two-run homer in the bottom of the eighth inning to lift the Mets to a 3-2 win over the Braves. “A small miracle,” is how Mets’ manager Bobby Valentine described the blast. 10. First win: After nine straight losses to open their inaugural 1962 season, the Mets finally won their first game on April 23. They beat the Pirates 9-1 at Forbes Field in Pittsburgh behind the five-hit pitching of left-hander Jay Hook. Felix Mantilla and Elio Chacon each had three hits, and Chacon, Bobby Smith and Hook each knocked in a pair of runs to pace the attack The Mets won just 40 games the whole year. Jim Hickman becomes the first Met to hit for the cycle (a natural cycle at that) as the Mets beat the Cardinals 7-3 in this 1963 game at the Polo Grounds…Tom Seaver retires the first 25 Cubs before Jimmy Qualls singles with one out in the ninth. Seaver finishes with a one-hitter in the Mets 4-0 win which set the tone for the 1969 season…Center fielder Tommy Agee makes a pair of stunning catches and Gary Gentry and Nolan Ryan combine to blank the Orioles 5-0 in Game 3 of the 1969 World Series… Lenny Dykstra’s two-run, walk-off homer leads the Mets to a 5-4 win in Game 3 of the 1986 ALCS…Dave Milicki hurls a nine-hit shutout as the Mets beat in the Yankees 6-0 in their first inter-league meeting in 1997… Al Leiter pitches a brilliant two-hitter as the Mets beat the Reds 5-0 in a 1999 playoff tiebreaker game in Cincinnati…Todd Pratt homers in the 10th inning as the Mets beat the Diamondbacks 4-3 and wrap up the NLDS in four games…Robin Ventura hits a grand slam single as the Mets beat the Braves 4-3 in Gave 5 of the 1999 NLCS…Trailing 8-1 going into the bottom of the eighth, the Mets score 10 runs, capped by a Mike Piazza three-run homer, and beat the Braves in this 2000 contest at Shea Stadium…Mike Hampton pitches a three-hitter and the Mets advance to the first Subway Series in 44 years with a 7-0 win over the Cardinals in Game 5 of the 2000 NLCS.